Your search returned 215 matches. abiephage Yasuda, 1975 (Archippus), Bull. Univ. Osaka Pref. (B) 27: 109. TL: Japan, "Hok-kaido, Yamabe". Holotype: OPU. male. abiephaga "Issiki, in Issiki & Mutuura", 1962 (Ariola), Publ. ent. Lab. Univ. Osaka Pref. 7: 3. TL: Japan. "Honshu, Koozuke [Gunma Prefecture], Manza". Holotype: USNM. male. alberta McDunnough, 1923 (Tortrix), Can. Ent. 55: 167. TL: Canada, "Alberta, Nordegg". Holotype: CNC. male. alcmaeonis Meyrick, 1928 (Cacoecia), Exotic Microlepid. 3: 455. TL: India, "Assam, Shillong". Lectotype: BMNH. female. alleni Tuck, 1990 (Archips), Ent. Scand. 21: 186. TL: Thailand, Khao Yai National Park. Holotype: BMNH. male. arcanus Razowski, 1977 (Archips), Acta zool. cracov. 22(5): 74 TL: China, "Chekiang Province, West Tien-mu-shan". Holotype: ZFMK. male. argyrospila Walker, 1863 (Retinia), List Specimens lepid. Insects Colln. Br. Mus 28: 373. TL: USA, Georgia. Holotype: BMNH. female. columbiana McDunnough, 1923 (Cacoecia), Can. Ent. 55: 167. TL: Canada. "British Columbia, Salmon Arm". Holotype: CNC. female. furvana Robinson, 1869 (Tortrix), Trans. Am. ent. Soc 2: 265. TL: USA. New York. Lectotype: ANSP. female. vsignatana Packard, 1875 (Tortrix), Rep. Ins. Mass. Injurious Veg. : 238. TL: USA. Massachusetts. Syntype(s): Unknown. unknown. asiaticus Walsingham, 1900 (Archips), Ann. Mag. nat. Hist. (7)5: 380 TL: Korea, Gensan. Lectotype: BMNH. male. contemptrix "Meyrick, in Caradja", 1925 (Cacoecia), Bull. Sect. scient. Acad. roum 3: 378. TL: China. Canton. Holotype: MGAB. female. atrolucens Diakonoff, 1941 (Cacoecia), Treubia 18: 384. TL: Indonesia, "Java, Sindangkaya". Holotype: NCB. male. audax Razowski, 1977 (Archips), Acta zool. cracov. 22(5): 81 TL: Japan, "Honshu, Nara Prefecture, Kojindake". Holotype: ISEZ. male. bachmanus Razowski, 2009 (Archips), SHILAP Revta. Lepid. 37: 45. TL: Vietnam, Mt. NgocLinh. Holotype: MNHU. female. baolokia Razowski, 2009 (Archips), Polskie Pismo Entomol. 78: 17. TL: Vietnam, Bao Lok. Holotype: MNHU. male. barlowi Tuck, 1990 (Archips), Ent. Scand. 21: 193. TL: Malaysia, "West Pahang, Genting Tea Estate". Holotype: BMNH. male. betulana Hubner,  (Phalaena (Tortrix)), Beitr. Gesch. Schmett. 1 (2): 3. TL: Germany, Augsburg. Syntype(s): Unknown. unknown. decretana Treitschke, 1835 (Tortrix), Schmett. Eur. 10 (3): 56. TL: Europe. Syntype(s): TMB. unknown. qinghai Liu, 1987 (Archips decretana ssp. ), Sinozoologia 5: 138. TL: China. "Qinghai Province, Huangzhong". Holotype: IZAS. male. biforata Meyrick, 1930 (Cacoecia), Ann. Naturhist. Mus. Wien 44: 224. TL: Brazil, Serra do Itatiaya. Holotype: NHMV. female. binigrata Meyrick, 1928 (Cacoecia), Exotic Microlepid. 3: 456. TL: India, "Assam, Shillong". Lectotype: BMNH. male. breviplicanus Walsingham, 1900 (Archips), Ann. Mag. nat. Hist. (7)5: 382 TL: Korea, Gensan. Holotype: BMNH. male. criticana Kennel, 1901 (Cacoecia), Dt. ent. Z. Iris 13 (1900): 213. TL: Russia. Holotype: MNHU. male. brunneatus Razowski, 2009 (Archips), SHILAP Revta. Lepid. 37: 44. TL: Vietnam, "Sa Pa, Fan Si Pan". Holotype: MNHU. female. bulbosus Razowski, 2009 (Archips), SHILAP Revta. Lepid. 37: 44. TL: Vietnam, "Sa Pa, Fan Si Pan Mtns.". Holotype: MNHU. female. cantinus Razowski, 2006 (Archips), Acta Zool. Cracov. 49B: 122. TL: India, "Jammu and Kashmir (Indien J & K, Srinagar)". Holotype: ISEZ. male. capsigerana Kennel, 1901 (Cacoecia), Dt. ent. Z. Iris 13 (1900): 212. TL: Russia, "Primorsky K, Askold, Dorries". Holotype: MNHN. male. 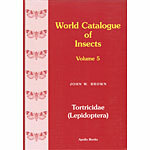 carteri Rose & Pooni, 2004 (Archips), Entomon 29: 152. TL: India, "Dist. Kangra, Palampur". Holotype: HIMPR. male. cerasivorana Fitch, 1856 (Lozotaenia), Rep. Ins. New York : 382. TL: USA, New York. Syntype(s): Unknown. unknown. ceylonicus Razowski, 1977 (Archips), Acta zool. cracov. 22: 108 TL: Sri Lanka, "Hakgala, Botanic Gardens". Holotype: NHRS. male. citimus Razowski, 1977 (Archips), Acta zool. cracov. 22(5): 109 TL: Afghanistan, "Sefed Kuh, S. Seite, Kotkai". Holotype: LNK. male. compitalis Razowski, 1977 (Archips), Acta zool. cracov. 22(5): 118 TL: China, "Chekiang, West Tien-mu-shan". Holotype: ZFMK. male. crassifolianus Liu, 1990 (Archips), Forest Research 3(2): 137. TL: China, "Gansu Province, Wuwei, Mt. Qilia". Holotype: IZAS. male. crataegana Hubner, [1796-1799] (Tortrix), Samml. Eur. Schmett. "7: pl. 17, fig. 107." TL: Europe, Syntype(s): Unknown. unknown. confluens Obraztsov, 1955 (Archips crataegana ab. ), Tijdschr. Ent. 98: 311. TL: Europe. Holotype: Unknown. unknown. endoi Yasuda, 1975 (Archips), Bull. Univ. Osaka Pref. (B) 27: 97. TL: Japan. "Honshu, Akita Prefecture, Yawata". Holotype: OPU. male. roborana Hubner, [1796-1799] (Tortrix), Samml. Eur. Schmett. "7: pl. 20, fig. 126." TL: Europe. Syntype(s): Unknown. unknown. rubromaculata Schawerda, 1933 (Cacoecia crataegana ab. ), Z. ost. Ent. Ver. 18: 76. TL: Corsica. "Corsica, Monte d'Oro". Holotype: Unknown. unknown. davisi Kawabe, 1989 (Archips), Tinea 12: 191. TL: Taiwan, "Hualien Hsien, Tayulin". Holotype: USNM. male. dichotoma Falkovitsh, 1965 (Archips), Ent. Obozr. 44: 417. TL: Russia, "PrimorskyKrai, Okeanskaya, near Vladivostok". Holotype: ZISP. male. dierli Diakonoff, 1976 (Archips), Zool. Verh. Leiden 144: 83. TL: Nepal, "Prov. No. 3 East, Junbesi". Holotype: ZSM. male. dispilana Walker, 1864 (Pandemis), List Specimens lepid. Insects Colln. Br. Mus. 30: 983. TL: Bhutan, Bhutan. Holotype: BMNH. male. dissitana Grote, 1879 (Tortrix (Ptycholoma)), N. Am. Ent. 1: 29. TL: USA, "New York, Buffalo". Lectotype: BMNH. male. eleagnana McDunnough, 1923 (Cacoecia), Can. Ent. 55: 166. TL: Canada, "Manitoba, Aweme". Holotype: CNC. male. elongatus Liu, 1987 (Archips), Sinozoologia 5: 138. TL: China, "Shanxi Province, Ningsgan". Holotype: IZAS. male. emitescens "Meyrick, in Joannis", 1930 (Cacoecia), Annls Soc. ent. Fr. 98 (Suppl.) (1929): 712. TL: ?, (Cho ganh). Lectotype: MNHN. male. enodis Razowski, 1977 (Archips), Acta zool. cracov. 22(5): 86 TL: China, "Chekiang Province, West Tien-mu-shan". Holotype: ZFMK. male. eupatris Meyrick, 1908 (Cacoecia), J. Bombay Nat. Hist. Soc. 18: 614. TL: Sri Lanka, Ceylon [Sri Lanka] (Wellawaya). Holotype: BMNH. male. euryplintha Meyrick, 1923 (Cacoecia), Exotic Microlepid. 3: 53. TL: India, "Bangla, Darjiling, Mangpu". Holotype: BMNH. female. eximius Razowski, 1984 (Archips), Acta zool. cracov. 27(15): 272 TL: China, "Yunnan Province, Likiang". Holotype: ZFMK. female. expansa Diakonoff, 1941 (Cacoecia), Treubia 18: 413. TL: Indonesia, "West Java, Mt. Gede, Tjibodas". Lectotype: NCB. male. aperta Diakonoff, 1968 (Archips), Bull. U.S. natn. Mus. 257 (1967): 28. TL: Philippine Islands. Holotype: USNM. female. fervidana Clemens, 1860 (Lozotaenia), Proc. Acad. Nat. Sci. Philad. 12: 347. TL: USA, Pennsylvania. Lectotype: ANSP. unknown. paludana Robinson, 1869 (Tortrix), Trans. Am. ent. Soc 2: 275. TL: USA. Pennsylvania. Lectotype: AMNH. male. formosanus Kawabe, 1968 (Archippus), Tinea 7: 122. TL: Taiwan, "Chiayi, Alishan". Holotype: USNM. male. fraterna Tuck, 1990 (Archips), Ent. Scand. 21: 192. TL: Brunei, Brunei (Rampayoh R.). Holotype: BMNH. male. fumosus Yasuda, 1961 (Archips), Publ. ent. Lab. Univ. Osaka Pref. 6: 60. TL: Japan. "Hokkaido, Yamabe". Holotype: OPU. male. fuscocupreanus Walsingham, 1900 (Archips), Ann. Mag. nat. Hist. (7)5: 384 TL: Japan, "Kyushu, Satsuma". Lectotype: BMNH. male. ishidaii Matsumura, 1900 (Loxotaenia), Ent. Nachr 26: 194. TL: Japan. "Hokkaido, Sapporo". Holotype: EIHU. female. punicae Matsumura, 1931 (Cacoecia), 6000 Illust. Insects Japan-Empire : 1065 TL: Japan. "Honshu, Tokyo Prefecture, Shibuya". Lectotype: EIHU. female. rosaceana Ishikawa, 1915 (Archips), Bychgaizasshi 2 (9): 778. TL: Japan. Holotype: Unknown. unknown. georgiana Walker, 1863 (Retinia), List Specimens lepid. Insects Colln. Br. Mus 28: 372. TL: USA, Georgia. Holotype: BMNH. male. goyerana Kruse, 2000 (Archips), Proc. ent. Soc. Wash. 102: 742. TL: USA, "Louisiana, Assumption Parish, Pierre Part". Holotype: LSUB. male. grisea Robinson, 1869 (Tortrix), Trans. Am. ent. Soc. 2: 268. TL: USA, Ohio. Syntype(s): Unknown. unknown. brauniana Kearfott, 1907 (Cacoecia), Trans. Am. ent. Soc 23: 69. TL: USA. Ohio. Lectotype: AMNH. male. gyraleus Diakonoff, 1982 (Archips), Zool. Verh. Leiden 193: 87. TL: Sri Lanka, "Ratnapura District, Uggalkaltota". Holotype: USNM. male. inanis Razowski, 1977 (Archips), Acta zool. cracov. 22(5): 107 TL: Afghanistan, "Safed Koh, S. Seite, Kotkai". Holotype: LNK. female. infumatana Zeller, 1875 (Tortrix), Verh. zool.-bot. Ges. Wien 25: 216. TL: USA, Missouri. Lectotype: BMNH. male. ingentana Christoph, 1881 (Tortrix), Bull. Soc. Imp. Nat. Moscou 56 (1): 64. TL: Russia, "Primorsky Krai, Vladivostok". Lectotype: BMNH. female. inopinatana Kennel, 1901 (Pandemis), Dt. ent. Z. Iris 13 (1900): 220. TL: Russia, "Primorsky Krai, Askold Island". Holotype: MNHN. male. insulanus Kawabe, 1965 (Archippus), Trans. lepid. Soc. Japan 16: 23. TL: Japan, "Kyushu, Kagoshima Prefecture, Okinoerabu-jima Island". Holotype: USNM. male. abietis Falkovitsh, 1965 (Archips), Ent. Obozr. 44: 414. TL: Russia. "Primorsky Krai, Okeanskaya, near Vladivostok". Holotype: ZISP. male. issikii Yasuda, 1961 (Archips), Publ. ent. Lab. Univ. Osaka Pref. 6: 62. TL: Japan. "Honshu, Tokyo Prefecture, Asakawa". Holotype: OPU. male. kangraensis Rose & Pooni, 2004 (Archips), Entomon 29: 150. TL: India, "Himachal Pradesh (?) (Dist. Kangra, Dharmshala)". Holotype: Unknown. male. kangraensis Rose & Pooni, 2004 (Archips), Entomon 29: 150. TL: India, "Dist. Kangra, Dharmshala". Holotype: HIMPR. male. kellerianus Liu, 1987 (Archips), Sinozoologia 5: 137. TL: China, "Yunnan Province, Kunming". Holotype: IZAS. female. limatus Razowski, 1977 (Archips), Acta zool. cracov. 22(5): 119 TL: China, "Shansi Province, Tapaishan Tsinling". Holotype: ZFMK. male. albatus Razowski, 1977 (Archips limatus ssp. ), Acta zool. cracov. 22(5): 120 TL: China. Holotype: ZFMK. male. machlopis Meyrick, 1912 (Cacoecia), Exotic Microlepid. 1: 4. TL: India, "Assam, Khasi Hills". Lectotype: BMNH. female. compacta Meyrick, 1918 (Cacoecia), Exotic Microlepid. 2: 164. TL: India. "Bengal, Pusa". Holotype: BMNH. female. isocyrta Meyrick, 1920 (Cacoecia), Exotic Microlepid. 2: 340. TL: India. "Bengal, Pusa". Holotype: BMNH. female. seminubila "Meyrick, in Joannis", 1930 (Cacoecia), Annls Soc. ent. Fr. 98 (Suppl.) (1929): 711. TL: North Vietnam. "Tonkin, Hoang su phi". Lectotype: MNHN. male. transcutata Meyrick, 1935 (Cacoecia), Exotic Microlepid. 4: 569. TL: Indonesia. "Java, Bogor, Buitenzorg". Holotype: BMNH. male. magnifica Tuck, 1990 (Archips), Ent. Scand. 21: 194. TL: Malaysia, "Sabah, Mt. Kinabalu". Holotype: BMNH. male. magnoliana Fernald, 1892 (Cacoecia), Can. Ent. 24: 121. TL: USA, "New York, Ithaca". Syntype(s): USNM. male. menotoma Meyrick, 1937 (Cacoecia), Dt. ent. Z. Iris 51: 173. TL: China, Yunnan Province. Holotype: BMNH. male. meridionalis Yasuda & Kawabe, 1980 (Archips), Tinea 11 (2): 9. TL: Japan, "Kagoshima Prefecture, Amami-oshima Island, Hatsuno : USNM". Holotype: USNM. male. mertias Rose & Pooni, 2004 (Archips), Entomon 29: 145. TL: India, "Dist. Kangra, Dharmshala". Holotype: HIMPR. male. micaceana Walker, 1863 (Cacoecia), List Specimens lepid. Insects Colln. Br. Mus 28: 314: TL: China, Shanghai. Holotype: BMNH. female. eucroca Diakonoff, 1958 (Cacoecia), Beitr. Ent. 8: 119. TL: China. South China (Canton). Holotype: DEIB. male. obscura Diakonoff, 1939 (Cacoecia micaceana var. ), Rec. Indian Mus. 41: 231. TL: India. "Dehra Dun, New Forest, Kandauli". Holotype: BMNH. male. mimicus "Walsingham, in Swinhoe", 1900 (Archips), Cat. East. and Aust. Lepid. Heterocera 2: 573. TL: India, Ooty. Lectotype: BMNH. male. epicyrta Meyrick, 1905 (Cacoecia), J. Bombay Nat. Hist. Soc. 16: 589. TL: Sri Lanka. Ceylon [Sri Lanka] (Maskeliya). Lectotype: BMNH. male. mortuana Kearfott, 1907 (Cacoecia), Can. Ent. 39: 158. TL: USA, Pennsylvania. Lectotype: AMNH. male. myricana McDunnough, 1923 (Cacoecia), Can. Ent. 55: 167. TL: Canada, "Ontario, Algonquin Park". Holotype: CNC. male. myrrhophanes "Meyrick, in Caradja", 1931 (Tortriz [sic]), Bull. Sect. scient. Acad. roum 14: 63. TL: China, Chekiang Province. Holotype: BMNH. male. adornatus Liu, 1987 (Archips), Sinozoologia 5: 139. TL: China. Holotype: IZAS. male. sayonae Kawabe, 1985 (Archips), Tinea 12: 5. TL: Taiwan. "Nantou Hsien, Nanshanchi". Holotype: USNM. male. naltarica Razowski, 2006 (Archips), Acta Zool. Cracov. 49B: 122. TL: Pakistan, Gilgit Naltar. Holotype: ISEZ. male. negundana Dyar, 1902 (Cacoecia), Proc. ent. Soc. Wash. 5: 78. TL: USA, "Colorado, Pike's Peak". Syntype(s): USNM. male. nigricaudana Walsingham, 1900 (Tortrix), Ann. Mag. nat. Hist. (7)5: 459 TL: Korea, Gensan. Holotype: BMNH. male. nigriplagana Franclemont, 1986 (Archips), Proc. ent. Soc. Wash. 88: 59. TL: USA, "New York, Tompkins Co., McLean Bogs Reserve". Holotype: USNM. male. okuiho Razowski, 2009 (Archips), Polskie Pismo Entomol. 78: 16. TL: Vietnam, Sa Pa Okui-ho. Holotype: MNHU. male. opiparus Liu, 1987 (Archips), Sinozoologia 5: 137. TL: China, "Guizhou Province, Fuquan". Holotype: IZAS. male. oporana Linnaeus, 1758 (Phalaena (Tortrix)), Systema Naturae (10th ed.) : 530. Syntype(s): Unknown. unknown. bathyglypta "Meyrick, in Caradja", 1932 (Cacoecia), Bull. Sect. scient. Acad. roum 15: 23. TL: China. Shanghai. Holotype: MGAB. male. dissimilana Bentley, 1845 (Lozotaenia), Zoologist 3: 1000 TL: United Kingdom. England (New Forest) [United Kingdom]. Syntype(s): Unknown. unknown. hermanniana [Denis & Schiffermuller], 1775 (Tortrix), Syst. Verz. Schmett. Wienergegend : 317. TL: Austria. Syntype(s): Unknown. unknown. impervia "Meyrick, in Joannis", 1930 (Cacoecia), Annls Soc. ent. Fr. 98 (Suppl.) (1929): 711. Holotype: MNHN. male. piceana Linnaeus, 1758 (Phalaena (Tortrix), Systema Naturae (10th ed.) : 531. TL: Europe. Syntype(s): Unknown. unknown. similis Butler, 1879 (Cacoecia), Illust. typical Specimens Lepid. Heterocera Colln. Br. Mus 3: 79. TL: Japan. Lectotype: BMNH. female. pachyvalvus Liu, 1987 (Archips), Sinozoologia 5: 140. TL: China, "Sichuan Province, Wolong". Holotype: IZAS. male. packardiana Fernald, 1886 (Tortrix), Bull. U.S. Dept. Agric. 12: 20. TL: USA, "Maine, Peaks Island, Casco Bay". Lectotype: USNM. male. paredraea Meyrick, 1931 (Cacoecia), Exotic Microlepid. 4: 149. TL: Taiwan, Taihoku. Lectotype: BMNH. male. pensilis Meyrick, 1920 (Cacoecia), Exotic Microlepid. 2: 339. TL: India, South India (Madras). Holotype: BMNH. female. peratratus Yasuda, 1961 (Archips), Publ. ent. Lab. Univ. Osaka Pref. 6: 63. TL: Japan, "Kyushu, Kagoshima Prefecture, Mt.Kirisima". Holotype: OPU. male. philippa Meyrick, 1918 (Cacoecia), Exotic Microlepid. 2: 165. TL: India, NW India (Abbottabad). Holotype: BMNH. male. pruneticola Meyrick, 1935 (Cacoecia), Exotic Microlepid. 4: 569. TL: India. Tarnab. Holotype: BMNH. male. subsidiaria Meyrick, 1924 (Cacoecia), Exotic Microlepid. 3: 107. TL: India. "Kashmir, Srinagar". Lectotype: BMNH. male. podana Scopoli, 1763 (Phalaena), Ent. Carn. : 232. TL: Slovenia, Carniola [Slovenia]. Syntype(s): Unknown. unknown. ameriana Treitschke, 1830 (Cacoecia), Schmett. Eur. 8: 49. TL: Europe. Syntype(s): TMB. unknown. congenerana Hubner, [1823-1824] (Tortrix), Samml. Eur. Schmett. "7: pl. 47, fig. 295." TL: Europe. Syntype(s): Unknown. unknown. fulvana [Denis & Schiffermuller], 1775 (Tortrix), Syst. Verz. Schmett. Wienergegend : 128. TL: Austria. Syntype(s): Unknown. unknown. meridana Kozlov & Esartia, 1991 (Archips), Vestnik Zool. 1991 (1): 34. TL: Georgia. Georgia. Holotype: ZISP. male. pyrastrana Hubner, [1796-1799] (Tortrix), Samml. Eur. Schmett. "7: pl. 20, fig. 124." TL: Europe. Syntype(s): Unknown. unknown. sauberiana Sorhagen, 1882 (Tortrix podana var. ), Berl. Ent. Z. 26: 131. TL: Europe. Syntype(s): Unknown. unknown. vulpeculana Fuchs, 1903 (Tortrix), Stettin. ent. Ztg. 64: 3. TL: Turkey. Konia. Holotype: Unknown. female. pseudotermias Rose & Pooni, 2004 (Archips), Entomon 29: 146. TL: India, "Punjab, Dist. Patiala". Holotype: PUP. male. pulchra Butler, 1879 (Ariola), Illust. typical Specimens Lepid. Heterocera Colln. Br. Mus 3: 19. TL: Japan, Lectotype: BMNH. male. punctiseriata Strand, 1920 (Catamacta), Archiv f. Naturgesch. 84 (A) (12): 191. TL: Taiwan, [Taiwan]. Holotype: DEIB. unknown. purpurana Clemens, 1865 (Loxotaenia), Proc. ent. Soc. Philad. 5: 136. TL: USA, Pennsylvania. Holotype: ANSP. unknown. gurgitana Robinson, 1869 (Tortrix), Trans. Am. ent. Soc 2: 263. TL: USA. Illinois. Lectotype: ANSP. female. lintneriana Grote, 1873 (Tortrix), Trans. Am. ent. Soc 4: 424. TL: USA. New York. Syntype(s): Unknown. unknown. rileyana Grote, 1868 (Tortrix), Trans. Am. ent. Soc 2: 121. TL: USA, Missouri. Syntype(s): Unknown. unknown. fervidana Walker, 1863 (Cacoecia), List Specimens lepid. Insects Colln. Br. Mus 28: 313. TL: USA. Georgia. Holotype: BMNH. male. rosana Linnaeus, 1758 (Phalaena (Tortrix)), Systema Naturae (10th ed.) : 530. Syntype(s): Unknown. unknown. acerana Hubner, [1796-1799] (Tortrix), Samml. Eur. Schmett. "7: pl. 19, fig. 118." TL: Europe. Syntype(s): Unknown. unknown. ameriana Linnaeus, 1758 (Phalaena (Tortrix)), Systema Naturae (10th ed.) : 531. TL: North America. Syntype(s): Unknown. unknown. avellana Linnaeus, 1758 (Phalaena (Tortrix)), Systema Naturae (10th ed.) : 531. TL: North America. Lectotype: LSL. male. hewittana Busck, 1920 (Cacoecia), Can. Ent. 52: 125. TL: Canada. "Nova Scotia, Sydney". Holotype: CNC. male. laevigana [Denis & Schiffermuller], 1775 (Tortrix), Syst. Verz. Schmett. Wienergegend : 129: TL: Austria. Vienna. Syntype(s): Unknown. unknown. nebulana Stephens, 1834 (Lozotaenia), Illust. Br. Ent. (Haustellata) 4: 74. Syntype(s): BMNH. unknown. obscura Dufrane, 1944 (Cacoecia rosana ab. ), Bull. Mus. R. Hist. Nat. Belg 20(18): 8 TL: Belgium. Mons. Holotype: IRSN. male. ochracea Dufrane, 1945 (Cacoecia rosana ab. ), Bull. Mus. R. Hist. Nat. Belg. 20(18): 8. TL: ?. Saint-Symphorien. Holotype: IRSN. female. orientana Krulikowsky, 1909 (Cacoecia rosana var. ), Mater. Pozn. Faun. ross. Imp 9: 203. TL: Russia. Syntype(s): Unknown. unknown. oxyacanthana Hubner, [1796-1799] (Tortrix), Samml. Eur. Schmett. "7: pl. 18, fig. 117." TL: Europe. Syntype(s): Unknown. unknown. splendana Kennel, 1910 (Cacoecia rosana var. ), Palaear. Tortr. : 131. TL: Europe. Syntype(s): MNHU. unknown. testaceana Eversmann, 1844 (Tortrix), Fauna Lepid. Volgo-Ural. : 486. TL: Russia. "Kasan, Orenburg". Syntype(s): ZISP. unknown. variana Fabricius, 1787 (Pyralis), Mantissa Insectorum 2: 231. TL: Germany. Syntype(s): Unknown. unknown. rudy Razowski, 1977 (Archips), Acta zool. cracov. 22(5): 146 TL: China, "Shansi Province, Tapaishan, Tsinling". Holotype: ZFMK. female. seditiosa Meyrick, 1921 (Cacoecia), Zool. Meded 6: 147. TL: Indonesia, "Java, Buitenzorg". Lectotype: NCB. female. brachytoma Meyrick, 1932 (Cacoecia), Exotic Microlepid. 4: 341 TL: Malaysia. Kuala Lumpur. Holotype: BMNH. male. orientalis Diakonoff, 1941 (Cacoecia seditiosa ssp. ), Treubia 18: 414. TL: Indonesia. "East Java, Tengger Mountains, Nongodjajar". Lectotype: NCB. male. semiferanus Walker, 1863 (Lophoderus? ), List Specimens lepid. Insects Colln. Br. Mus 28: 336. TL: ?, Unknown [North America]. Holotype: BMNH. male. flaccidana Robinson, 1869 (Tortrix), Trans. Am. ent. Soc 2: 277. TL: USA. Holotype: Unknown. unknown. semistructa Meyrick, 1937 (Cacoecia), Exotic Microlepid. 5: 126. TL: China, Taichow. Holotype: BMNH. male. brevicervicus Yasuda, 1961 (Archips), Publ. ent. Lab. Univ. Osaka Pref. 6: 59. TL: Japan. "Honshu, Osaka Prefecture, Sakai". Holotype: OPU. male. shibatai Kawabe, 1985 (Archips), Tinea 12: 1. TL: Taiwan, "Chiai Hsien, Fenchihu". Holotype: USNM. male. silvicolanus Razowski, 2009 (Archips), SHILAP Revta. Lepid. 37: 43. TL: Vietnam, Fan Si Pan. Holotype: MNHU. male. solida Meyrick, 1908 (Cacoecia), J. Bombay Nat. Hist. Soc. 18: 614. TL: India, "Bangla, Darjiling". Lectotype: BMNH. male. spinatus Liu, 1987 (Archips), Sinozoologia 5: 139. TL: China, "Liaoning Province, Dandong". Holotype: IZAS. male. stellata Jinbo, 2006 (Archips), Entomological Science 9: 335. TL: Japan, "Nagano, Kawakami-mura, Kawakami-makioka rindo". Holotype: NSMT. male. strianus Fernald, 1905 (Archips), Can. Ent. 37: 399. TL: Canada, Quebec. Syntype(s): USNM. 1 male. strigopterus Liu, 1987 (Archips), Sinozoologia 5: 139. TL: China, "Sichuan Province, Wolong". Holotype: IZAS. male. strojny Razowski, 1977 (Archips), Acta zool. cracov. 22(5): 101 TL: China, "Hunan Province, Hoengshan". Holotype: ZFMK. male. subgyraleus Razowski, 2009 (Archips), SHILAP Revta. Lepid. 37: 44. TL: Vietnam, "Kon Tum, Dac Glei". Holotype: MNHU. male. subrufana Snellen, 1883 (Tortrix), Tijdschr. Ent. 26: 187. TL: Russia, "Primorsky Krai, Suifun". Syntype(s): NCB. 1 male. coreensis Park, 1976 (Archippus), Ty to Ga 26: 110. TL: Korea. Suweon. Holotype: CISK. male. taichunganus Razowski, 2000 (Archips), Zool. Studies 39: 323. TL: Taiwan, "Taichung, Pilushi". Holotype: CMNH. female. taiwanensis Kawabe, 1985 (Archips), Tinea 12: 3. TL: Taiwan, "Nantou Hsien, Lushan Spa". Holotype: USNM. male. termias Meyrick, 1918 (Cacoecia), Exotic Microlepid. 2: 164. TL: India, "Assam, Shillong". Lectotype: BMNH. male. argutus Diakonoff, 1976 (Archips termias ssp. ), Zool. Verh. Leiden 144: 91. TL: Nepal. "Prov. No. 3 East, Bujan, Dudh Kosi". Holotype: ZSM. male. pomivora Meyrick, 1920 (Cacoecia), Exotic Microlepid. 2: 340. TL: India. "Himalaya, Kumaon, Ramgarh". Holotype: BMNH. male. sarcostega Meyrick, 1924 (Cacoecia), Exotic Microlepid. 3: 106. TL: India. "Kumaon, Muktesar". Lectotype: BMNH. male. stenoptycha Diakonoff, 1951 (Homona termias ssp. ), Ark. Zool. (2) 3: 65. TL: India. Burma (Kambaiti). Holotype: NHRS. male. tharsaleopa "Meyrick, in Caradja & Meyrick", 1935 (Cacoecia), Mat. Microlepid. Fauna Chin. Prov. : 50. TL: China, "Chekiang Province, Tien-mu-shan". Holotype: BMNH. male. weixiensis Liu, 1987 (Archips tharsaleopa ssp. ), Sinozoologia 5: 140. TL: China. "Yunnan Province, Weixi". Holotype: IZAS. male. yunnanus Razowski, 1977 (Archips), Acta zool. cracov. 22(5): 84 TL: China. Holotype: ZFMK. male. tsuganus Powell, 1962 (Archippus), Can. Ent. 94: 842. TL: Canada, "British Columbia, Knight Inlet". Holotype: CNC. male. unimaculata Shiraki, 1913 (Archips), Spec. Rep. Formosa Agric. Exp. Stn. 8: 344. TL: Taiwan, Formosa [Taiwan]. Holotype: Unknown. unknown. vagrans Tuck, 1990 (Archips), Ent. Scand. 21: 180. TL: Indonesia, East Timor. Holotype: BMNH. male. viola Falkovitsh, 1965 (Archips), Ent. Obozr. 44: 415. TL: Russia, "Primorsky Krai, Okeanska-ya, near Vladivostok". Holotype: ZISP. male. purpuratus Kawabe, 1965 (Archips), Trans. lepid. Soc. Japan 16: 16. TL: Japan. "Honshu, Gunma Prefecture, Mt.Akagi". Holotype: USNM. male. vivesi Razowski, 2009 (Archips), Polskie Pismo Entomol. 78: 18. TL: Vietnam, "Sa Pa, Fan Si Pan". Holotype: MNHU. female. wallacei Tuck, 1990 (Archips), Ent. Scand. 21: 186. TL: Indonesia, "Sulawesi, Danau Mooat, near Kotamobagu". Holotype: BMNH. male. xylosteana Linnaeus, 1758 (Phalaena (Tortrix)), Systema Naturae (10th ed.) : 531. Lectotype: LSL. female. characterana Hubner, 1793 (Phalaena Tortrix), Samml. auser. Vogel Schmett. "11, pl. 58." TL: Europe. Syntype(s): Unknown. unknown. densata "Geoffroy, in Fourcroy", 1785 (Phalaena), Ent. Paris. 2: 304. TL: France. Syntype(s): MNHN. unknown. hybnerana Fabricius, 1794 (Pyralis), Entomologia Systematica 3(2): 247. TL: Germany. Syntype(s): Unknown. unknown. obliquana Fabricius, 1781 (Pyralis), Species Insectorum 2: 281. TL: Great Britain. Syntype(s): Unknown. unknown. pallens Kennel, 1910 (Cacoecia xylosteana var. ), Palaear. Tortr. 130. TL: Europe. Syntype(s): MNHU. unknown. sabrinae Leraut & Luquet, 1996 (Archips xylosteana ssp. ), Alexanor 19 (1995): 250. TL: France. "Var, Maures, Cavalaire". Holotype: MNHN. female. westriniana Thunberg & Borgstrom, 1784 (Tortrix), D. D. Dissert. Ent. Sist. Ins. Svecica 1: 21. TL: Sweden. Uppland. Lectotype: Unknown. male.